At least six people died and dozens rushed to hospital after an Amtrak train on its inaugural run in Washington has derailed. The carriages crashed on to the highway below at the height of the morning rush hour. Police say there were “multiple” fatalities on board the train, which hit vehicles on the I-5 highway below. Images from the scene show that all the carriages of the high-speed train appear to have left the track. It was Amtrak’s first passenger service to run on a new, shorter route. Train 501 had left Seattle, heading south for Portland, at 06:00 local time. The derailment happened on a section of track, south of Tacoma, previously only used for freight trains. Reports suggest 77 people have been taken to hospital. Several cars on the highway were struck by the derailed carriages. Aerial images show the train’s carriages littered across the ground, on both sides of the bridge carrying the railway over the highway. Pierce County Sheriff’s department spokesman Ed Troyer said there were “multiple” fatalities on the train but no motorists had been killed. The fire department had taken many people out of the train and they had been transported to hospitals, he added. President Donald Trump’s first reaction to the derailment was to tweet that it showed the need for his forthcoming infrastructure plan. The president later added that his thoughts and prayers were with those involved. Washington Governor Jay Inslee has declared a state of emergency in two counties. 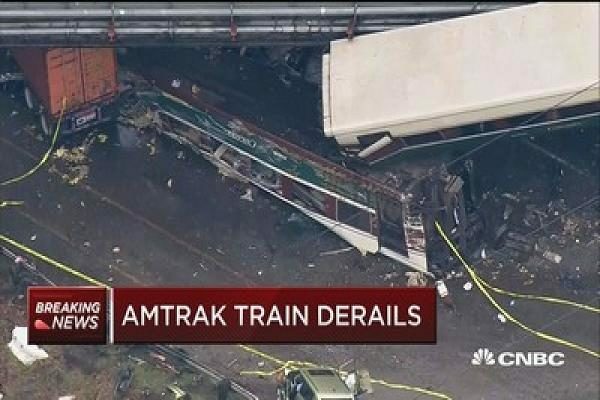 Amtrak said approximately 78 passengers and five crew members had been on board the train. Gov Jay Inslee said he was praying for the many injured. Officials have set up a family reunification center at DuPont city hall, and asked people not to come to the scene of the crash.